8 People who can PROVE the King IS Alive! “Yesterday the long afterglow of a summer sun made glorious both the heavens above and the earth below, as the hour approached for the marriage of ….” (fill in the blank with the names of YOUR parents / grandparents / great-grandparents). 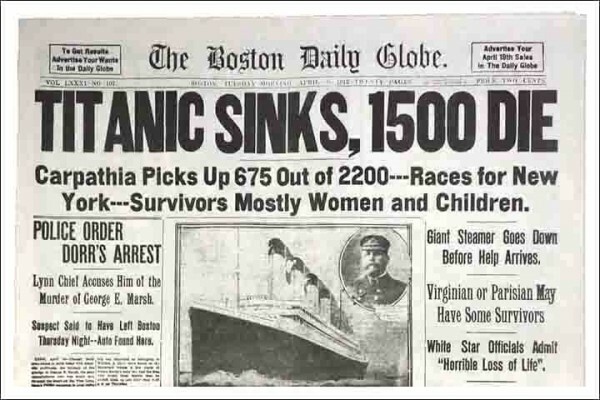 While saved for posterity, there’s just one little tiny problem with important clippings such as this: newspapers & newsprint clippings were never built for posterity! Acid-Free / Buffered / Un-Buffered). 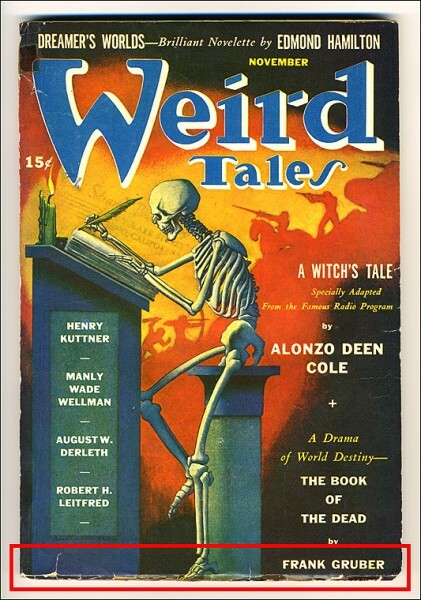 An old sci-fi pulp magazine from the 1950s. 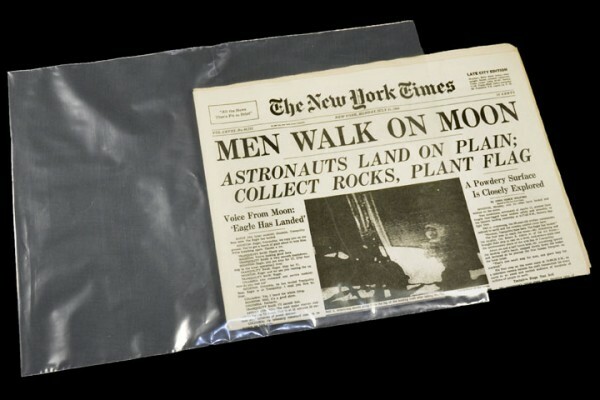 As the term “pulp” implies, the paper stock that was used for this magazine was not very much better than newsprint, and its interior pages are both yellowed and brittle. Notice the chipping and cracking at the bottom of this magazine’s cover (see red box). 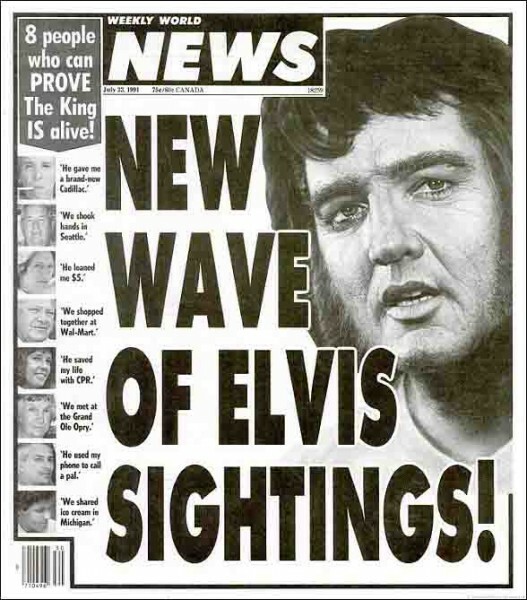 This is also often the case with old magazines in your collection. 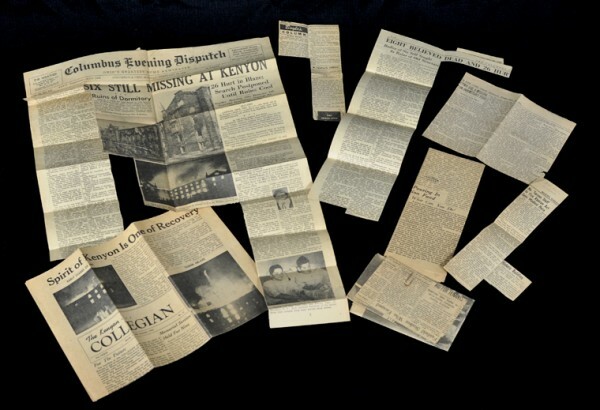 While perhaps “made of stronger stuff” than newsprint, long-term archival survivability was usually never on the minds of magazine publishers, and they can be just as fragile as old newspapers. Yet there ARE things you can do. 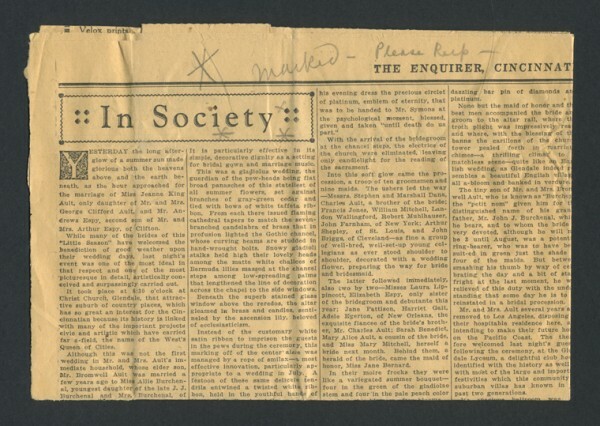 If a newspaper, clipping or magazine in your collection is of important historical or personal value, consider contacting a paper conservator who can neutralize some of the harmful acids and impurities (please see our complete blog on Conservators: Pros You Should Know). This can be costly if you are doing more than a handful of clippings, but such “deacidification” can enhance your newsprint’s life expectancy. More commonly, however, our customers accept the fact that newspapers and magazines will yellow and get brittle over time, and they simply want to extend that time by properly storing these artifacts under optimal conditions. This is where Archival Methods’ Newspaper & Magazine Storage Kits come into play (see pix above). 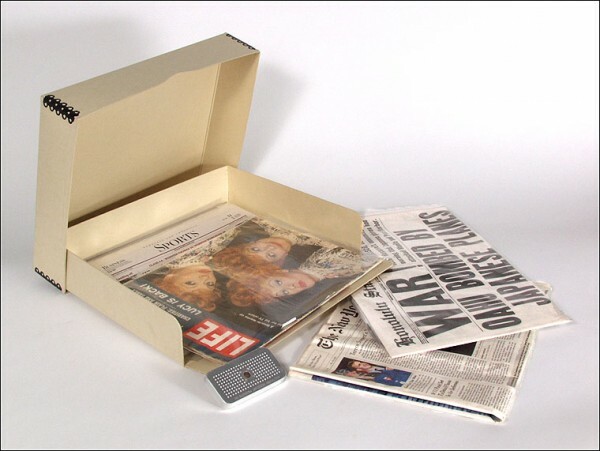 The best way to store your old newspapers and magazines with this kit is to place each artifact in its own archival-quality Polyethylene Bag (see pix above), and then store the individually bagged newspapers or magazines in the kit’s acid-free Drop-Front Box. To enhance this double-layer of protection, your box then needs to be stored in a cool, dry environment such as a closet or shelf in your “living space” of your home. This means avoiding basements or attics, as humidity and temperature variations can harm your materials, as can leaky attic roofs, and leaky basement pipes and water heaters (see pix below). The rule of thumb holds that if it is uncomfortable for YOU in terms of temperature and humidity (as is commonly the case in attics and basements), it will be “uncomfortable” for your stored newspapers and magazines. 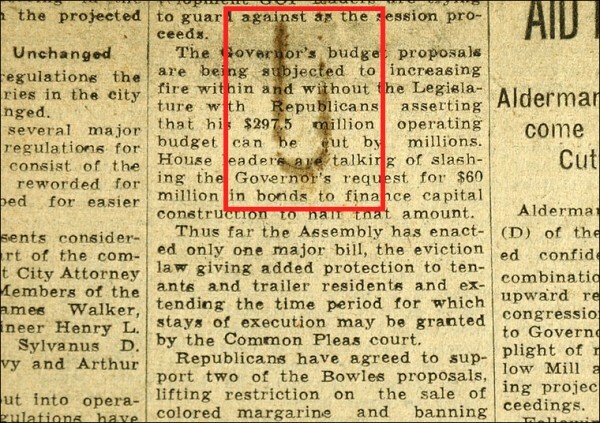 As visible evidence of the dangers of excess humidity, the stain on the newspaper clipping above was caused by high ambient humidity – the paperclip simply rusted from exposure to this humidity, the result of which is permanently stained paper. 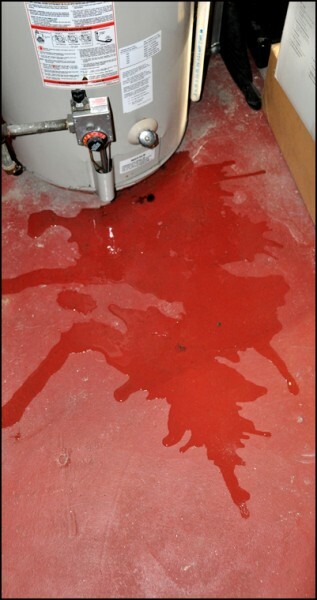 1) your collectibles and family artifacts do not need to get soaked (from leaky roofs / pipes / water heaters) in order to still suffer damage from the moisture in high humidity environments. This is one of the reasons we include a Desiccant Canister with each of our Newspaper & Magazine Storage Kits. 2) paper clips and staples should be carefully(!) 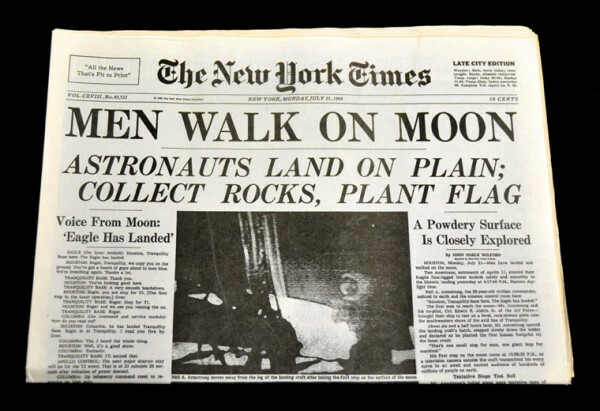 removed from your newspapers, clippings and magazines BEFORE storing them. 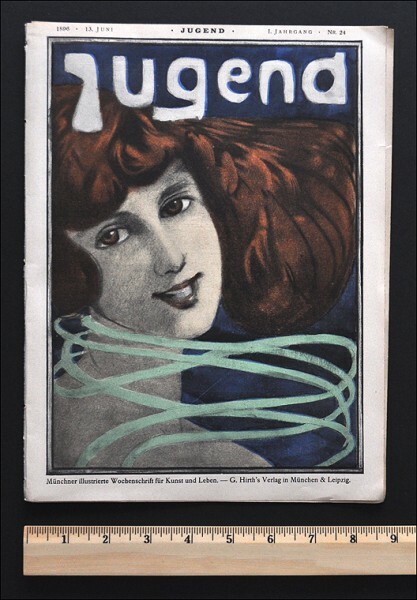 As another rule of thumb, however, do not remove binding staples from magazines such as the staple-bound copy of Jugend illustrated below. 9 x 12″ Small Magazine / Comic Storage Kit. To determine just which Newspaper & Magazine Storage Kit(s) are right for you, simply measure the length and width of your newspapers or magazines and order the appropriately-sized kit(s) from the chart on our web page. When you are considering your order you will also have the option of choosing which kind of re-usable desiccant you would like to receive with your kit. 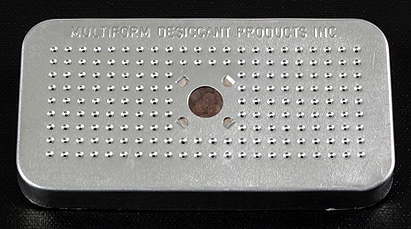 You can choose between our Metal Canister Desiccant, which is easily re-activated in a conventional oven; or our Plastic Canister Desiccant, which can be re-activated in a microwave oven (please click here for our PDF on re-activating our Metal and Plastic Desiccants Canisters). Lastly, one final hint – do not “stress” newspapers folds by packing them tightly into your storage box. Pack them rather loosely instead, as this will help keep newspaper creases from becoming too flattened, which can make them difficult to open without tearing. We would also like to encourage you to follow us on Twitter, Facebook, Pinterest, and our large selection of informative and crisply-illustrated (and often humorous) blogs for up-to-the-minute information and stories of interest.